Far older than his legend, the immortal Vlad Dracul has wandered the earth for centuries in search of the reincarnation of his wife, Elisabeta. Now he believes he has found the woman possessed by his beloved's soul and is prepared to make her his for all eternity. Tempest "Stormy" Jones is that mortal. She has long sensed the other, someone inside her fighting to take control, a feeling that becomes even stronger when the dark prince is near. But as Stormy denies the passion that burns between them, she also resists allowing Elisabeta to take over her mind and body to prevent her from claiming Vlad as her own. But when Elisabeta discovers Vlad's feelings for Stormy, her wrath knows no bounds. She demands that her destiny be fulfilled, and seeks to destroy her rival, leaving Vlad in anguish, tormented by what was...and what could be. Now only he can choose--who will live and who will die. Vlad returns in Prince of Twilight, but he's still not quite the star of the show. We got to really know Stormy Jones in previous stories in the series, and saw a lot of her in the book just previous (#11). In fact, book 11 seems to really set the stage for this book very nicely - even if this one happens several years later. Vlad is still looking for a way to reincarnate his dead wife - whose soul currently lives in Stormy. But doing so would kill Stormy, which he doesn't want to do either. Elisabeta (the wife) has no such scruples and just wants to come back any way she can. She makes quite the bad guy, especially since Stormy can't ever get away from her. The time Elisabeta has spent inbetween living and dead has warped her into a vindictive demon like essence. Much of the story revolves around her and Stormy duking it out mentally and spiritually to see who will remain in control. In the long run, Vlad will have to choose which woman he loves more. I had my doubts he would pick the right one for a long time! 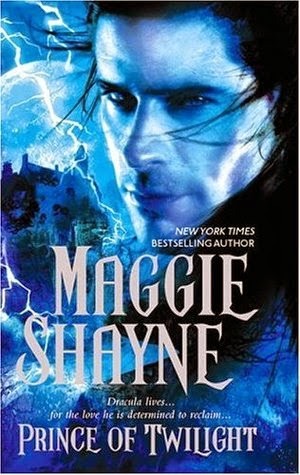 Maggie Shayne really knew how to draw the suspense out on this one in a good way. The closer I got to the end, the harder it was to set the book down and return to real life. The only big draw back to this story was that it didn't seem like its own complete book. So much happened between Vlad and Stormy in book 11 and so much is revealed through flashbacks that I really felt like history was being summarized and fed to me instead of drawing me in and just telling me about it. I'm still loving this series and the characters, so you'll be seeing a review for book 13 soon.